As for the box of apples, I used about half of it to make some applesauce the next week of course! Everything after the cinnamon is optional. Homemade applesauce doesn't need any sugar, especially if you use apple cider or juice when cooking. It can be frozen, in airtight containers, up to 2 months. 1. Combine apples, apple cider, cinnamon, vanilla bean and seed scrapings, the ginger, cardamom, nutmeg, mace, sugar and lemon juice in a large, heavy-bottomed wide saucepan. 2. Place the saucepan over medium heat and cook, stirring often with a wooden spoon to prevent scortching, until the apples are broken down and saucy, 50 to 60 minutes. Mash any large pieces of apple with the wooden spoon to help break them down. Season with more sugar and spices if desired. Remove apple mixture from heat and let stand to cool completely before serving, discarding the cinnamon stick and vanilla pod. The applesauce can also be stored in an airtight container for 2 to 3 days in the refrigerator. Hint for prepping the apples: Get a huge bowl, fill half way with water and dump a bunch of lemon juice in the water. As you are done with each piece of apple, just toss it into the bowl until you are ready to cook them. It will keep them from browning too terribly bad. You'll just need to drain them before putting them in the pot -- I drained them using a strainer like you would pasta. I am actually going to use more of the apples to make some additional applesauce because we ate the stuff so fast the first time! Brian even suggested adding frozen strawberries, which I am definitely going to do. Also planning on making our usual apple pie with crumble topping. 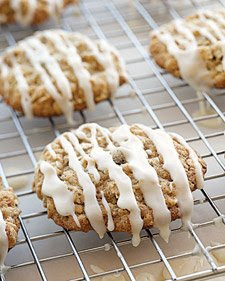 I also want to try and make some Iced Oatmeal Applesauce Cookies or maybe some Rustic Apple Tarts. Don't they look yummy?! Off to bake some stuff! You're making me hungry. 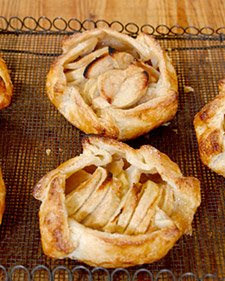 It's incredible all the things you can make with apples. Oooohh, yumy. YUMMY. My stomach is now growling, thanks a lot.